After our disastrous but amusing pizza experience in Chamonix, another Pizza Venerdi* rolled around and found us in Lugano, Switzerland. Leaving the old town, we found — I kid you not — Domino’s Pizza on the lakeside. This one is Ristorante Pizzeria Bar Domino. 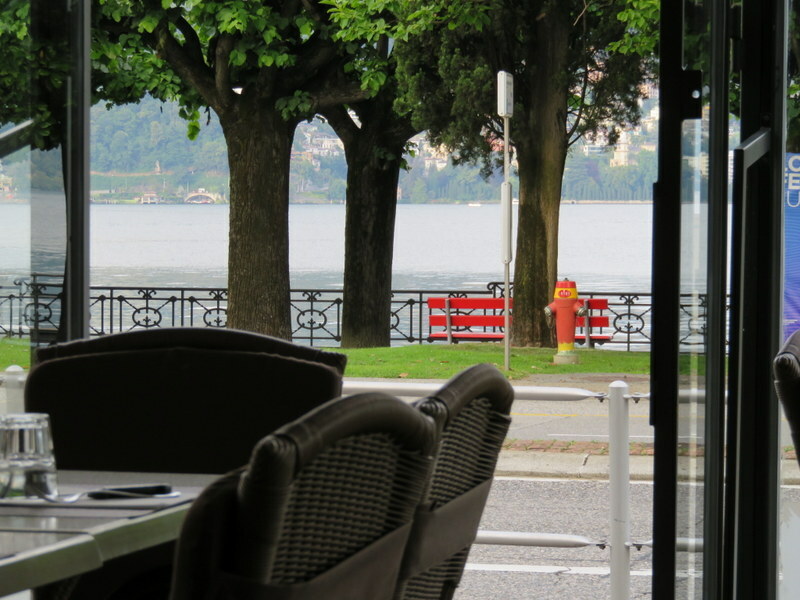 We were almost alone at Domino this evening, with rush hour over and a view of beautiful Lake Lugano just across the street. The (German) Federal Festival of Choirs in Costume, Lugano, 2016. 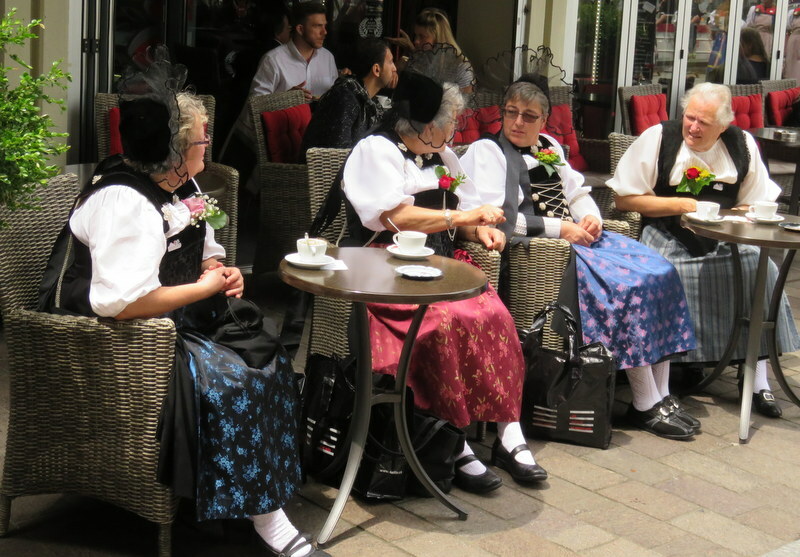 Our visit in Lugano was inadvertently timed for the Festa Federale delle Corali in Costume. 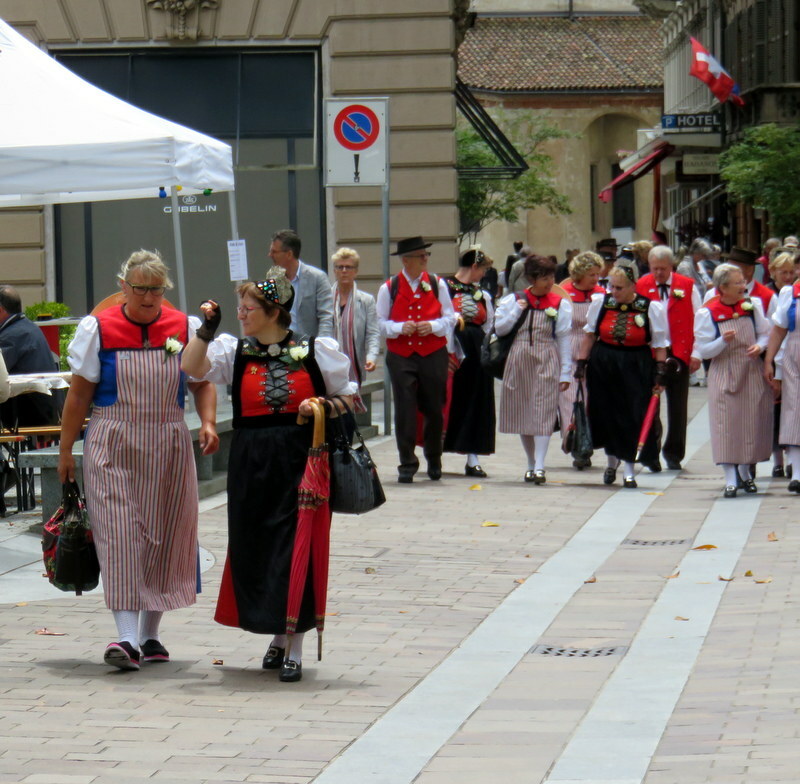 About 2000 German choral singers in folk costumes descended on Lugano our second day. Ric says at least half of them rode our bus. They made a colorful parade everywhere we went in Lugano. Ric’s Pizza Romana: Anchovies, olives and capers. Great cheese! Bar Domino was outside of the primary tourist zone. No German choral singers in sight, and in fact, few locals were there at 20:00 on a lovely Friday evening. As this is the Italian canton of Switzerland, we expected and received a good product. The choral groups from Germany were quite a colorful invasion. Pizza Quality: 2 Nothing terribly special but nonetheless a good pizza. The cheese was great, especially after last week’s plastic goo. I like to say it is all about the crust and this one was fine, but not on par with our favorites in Roma. Service: 3 A little detached but fine. Pizzas came out quickly and our needs were met. We do like that wait staff in Europe does not expect to develop a relationship with you over dinner. That’s a positive. The view to beautiful Lake Lugano. It was perhaps a 20-minute walk back to the old town from here. We were far away from the tourists. Ambiance: 3 It is rare to find a nice outdoor space at a pizzeria. Dar Poeta is in a scenic alley in Trastevere, the pizzeria we enjoyed on Korčula was in an amazing waterside location, and Rossini has a pleasant outdoor area with trams running by, a plus for Ric. Otherwise, the outside locations are unremarkable. Domino has a lovely location across from the lake, and it is a very nice post-consumption walk back to the old town. 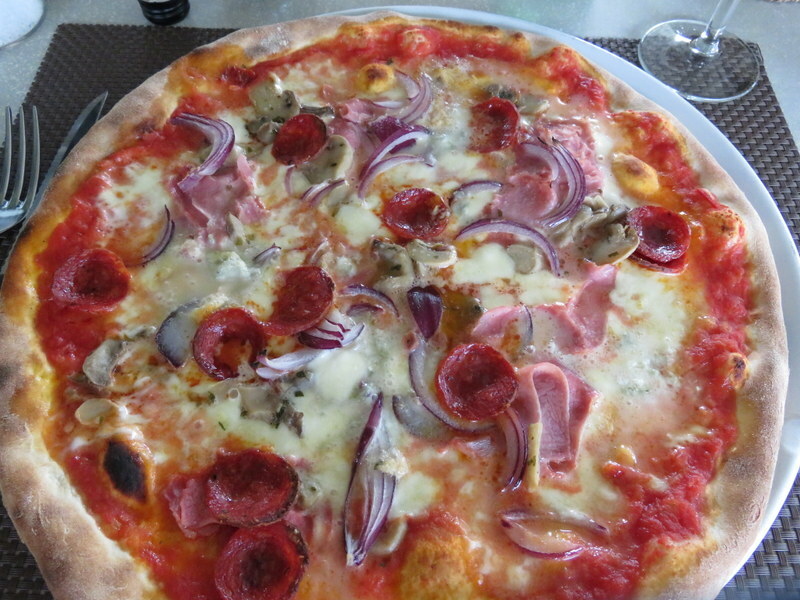 My pizza with red onions, prosciutto, salame piccante, and mushrooms was good, but actually the prosciutto was over-the-top and could have been left off. 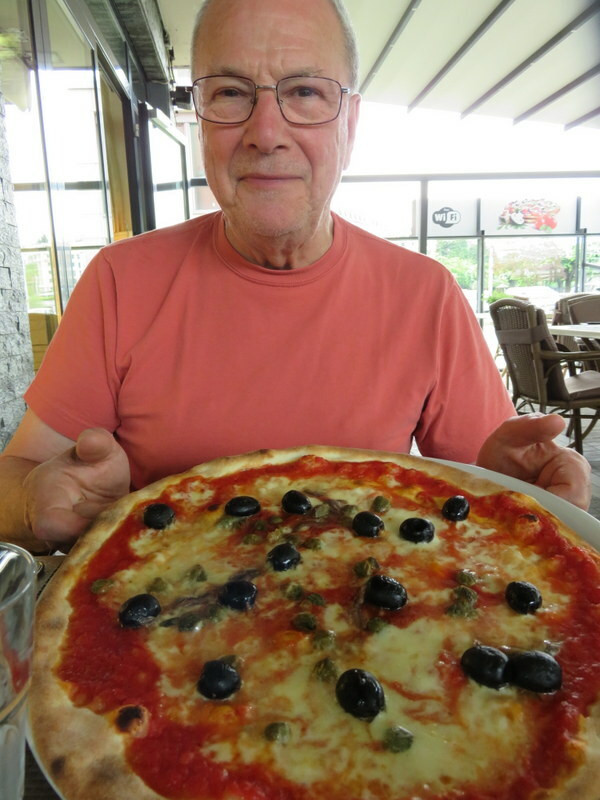 *Pizza Venerdi is a shout out to our Portiere who, every Friday, greets us with the knowledge that today is “Pizza Venerdi” (Pizza Friday) and thus time for Our Weekly Pizza.